Our research interests center on the structure and morphology of ordered polymeric systems and hybrid materials for energy, biomedical, and nanocomposites applications. 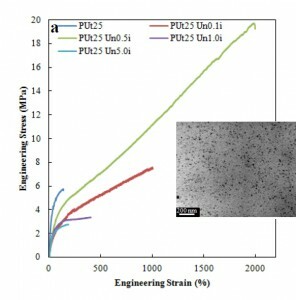 Using controlled polymer crystallization, we design, and grow functional polymer single crystals for applications including drug delivery, actuators, surface modification, naonparticle synthesis, surface enhanced Raman spectroscopy, catalysis, artificial nanomotors, etc. Related publications: Adv. Mater.2005, 17: 1198. Nano Letters, 2006, 6,1007. JACS 2006, 128, 1692. Macromolecules, 2008, 41, 9516. Nature Nanotech., 2009, 4, 358. Polymer2009, 50: 953. J. Polym. Sci. Pt. B-Polym. Phys.2009,47: 2436. Carbon, 2012, 50, 1769. Polymer2011, 52: 3633. ACS Nano, 2012, 6, 1204. Sci. Chi. Chem.2012, 55, 802. Macro. Rap. Commun,2013, 34, 251. Macromolecules, 2013, 46, 2877−2891. Related publications: JACS, 2007 129, 12. Macromolecules, 2008, 41, 149. JACS2008 129, 11594. Macromolecules, 2009, 42, 9394. Macro. Rap. Commun.2010, 31, 169. Macromolecules, 2010, 43, 9918. J. Mater. Chem., 2011, 21, 13155. J. Phys. Chem. Lett. 2012, 3, 1346. J. Mater. Chem.2012, 22, 15526. Macromolecules, 2012, 45, 8780. Nanoscale, 2012, 4, 7641. ACS Nano, 2013, 7, 5192-5198. 2. Solid Polymer Electrolytes (SPEs) for Energy Storage. We aim to design, synthesize advanced SPEs for energy device applications, with the focus on lithium batteries. Related publications: Nano Lett.2012, 12, 310. Curr. Opin. Chem. Engin.2013, 2, 63. Macromolecules 2014, 47, 3978-3986. RSC Advance 2015,5, 48793-48810. Macromolecules2015, 48, 4503–4510. Adv. Mater. 2015, 27, 5995–6001. Reconstruct bone structure using hierarchical nanostructures The orientation and spatial distribution of nanocrystals in the organic matrix are two distinctive structural characteristics associated with natural bone. Synthetic soft materials have been used to successfully control the orientation of mineral crystals. The spatial distribution of minerals in a synthetic scaﬀold, however, has yet to be reproduced in a biomimetic manner. We use block copolymer-decorated polymer nanoﬁbers to achieve biomineralized ﬁbrils with precise control of both mineral crystal orientation and spatial distribution. Exquisite nanoscale structural control in biomimetic hybrid materials has been demonstrated. Related publications: Macromolecules2008, 41: 9516. Macromolecules 2010, 43: 9918. ACS Nano, 2013, 7, 8251-8257. 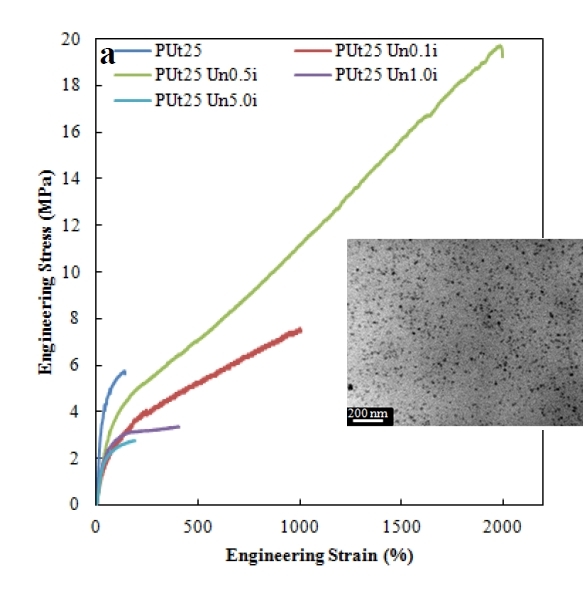 Polylactic acid, polyurathane, and cellulose nanocrystals, silica nanoparticles, and POSS have been incorporated into polymer nanocomposites using ins-situ polymerization and blending methods. Related publications: Polymer2006, 47: 1678. Polymer2010, 51: 2191. Polym. Degr. Stab.2012, 97, 192. Macromolecules2012, 45, 993.
hierachical nanostructures are constructed using liquid crystalline block copolymers. 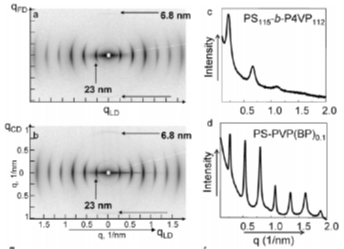 Subtle competition between liquid crysatlline order and block copolymer order have been studied by combining small angle X-ray and transmission electron microscopy. Related publications: Macromolecules2004, 37: 2854. J. Am. Chem. Soc.2005, 127: 15481. Macromolecules2006, 39: 517. Macromolecules2007, 40: 840. Macromolecules2007, 40: 5095. Soft Matter2008, 4: 458. Macromolecules2009, 42: 3510. Polymer2010,51: 3693.